Now that summer is around the corner there are a lot of people that are enjoying the sunshine and BBQ is one of the most social past times available. The problem facing a lot of people lately is that the price of meat has increased rather drastically, making the BBQ seem like an expensive social event. There are ways to cut down on how much money you spend on your BBQ so that you do not have to limit yourself during the summer! The following tips will allow you to BBQ the summer away without leaving you broke. Used instead of new grill – if you have to buy a new grill at the beginning of the season rather go for a good second hand one. Patience is key – if you have to buy a new grill, wait til the season is almost over and shops are putting grills on sale to clear stock before the season ends. Mark down meat – find out from your local shop when they cut the prices on their meat, meat bought on mark down will still be perfect to eat if you freeze it immediately. 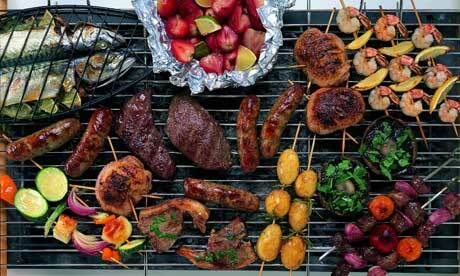 Grill everything – while you have the grill fired up put everything you can on top, everything can be grilled. Sales are stock up times – while things are on sale, like the steaks or charcoal which are normally expensive parts of a BBQ, stock up in preparation. Trashy treasure – Take the cut branches that your neighbors are throwing away home for your BBQ. Optimal Cuts – the larger cuts of meat are cheaper than the smaller ones, and after you have grilled the larger cuts its easy to cut into smaller sizes. From purchasing your replacement grill at the right time all the way through to saving on the meat you purchase for your BBQ, the article on Mint Life has practical tips for the BBQ lovers!